Here, copper is heated in a controlled way to creature a texture on its surface and the result is similar to the texture produced by the silversmithing process of reticulation. Heat causes the inner metal core to be on the verge of melting, whilst the surface remains almost solid. Because the core is practically liquid, the surface will move and fold in an unpredictable and varied way. 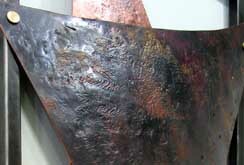 The copper wall sculptures above uses this technique, and other texturing methods, as part of their design.